Sánchez (2017): “Image of U.S. presidential candidates in Spanish digital ‘press’ ”. Revista Latina de Comunicación Social, 72, pp. 975 to 997. Introduction. This article analyses the image projected by Spain’s most popular online newspapers about the latest presidential elections campaign in the United States and, thus, also examines the influence these news media can have on the Spanish public opinion on this event. Hypotheses and objectives. The study is guided by the hypothesis that the personal features of and the drama surrounding the presidential candidates in the election campaign generated even more interest among citizens, and that the remoteness of the elections meant that Spanish people’s perception of each of the candidates was influenced by the political information provided by the news media they usually consume. Methods. The study is based on the content analysis of 817 news articles, 448 from elpais.es and 369 from ABC.es, published between 1 June and 8 November 2016. The selected news stories are those that included the keywords “Trump” and “Clinton” in their headline or sub headline. Results. The candidate who was featured in the largest number of headlines in both newspapers was Trump, while the most common headline type during the campaign was the informative (55.6%), followed by the appealing and impact types (with 21.2% and 23.3%, respectively). With regards to the informative treatment reflected in both newspapers, most news articles were framed against Trump. Conclusions. It can be concluded that the media did not only intervene in the creation of scenarios, but were also a key element in the construction of the candidates’ image. Political communication, public image, mass media, United States, 2016 presidential elections, candidates, Donald Trump, Hillary Clinton. 1. Introduction. 2. Hypotheses and methods. 3. Results. 4. Conclusions and discussion. 5. References. The 21st century has brought about a new revolution: information that was consumed on paper began to be consumed in digital formats in computers and more recently in mobile devices. Immediacy plays a central role, and the new generations are not willing to lose more than a few seconds waiting for a page to load in their computer. According to a study carried out by Gausby (2015) for Microsoft, the attention span has decreased to just eight seconds, while people aged 18 to 24 years use their mobile phone to watch TV, read the news and talk to friends, and they are not willing to read long and endless articles, even those that are published by the best newspapers. Already on 2 February 2002, the then President of the European Parliament, Mr Cox, in the debate on terrorism in Strasbourg, pointed out the agreement between the three European institutions: The Commission, the Council and Parliament. Later in the press conference, he said: “one image reveals more than a thousand words”, referring to the presidential table with representatives of each institution. At the moment, this statement marked the line of what we can call the revolution of immediacy. These are profound changes that generate the accommodation of the media to the new formats. The study of the U.S. presidential election shows that most of the news articles were short, with a headline, subhead, photo or video and few lines about the news story, which increased the number of short articles published per day. In this scenario, the exploitation of images in the PR strategies of the press offices of candidates to electoral elections is essential, while the organisation of events and meetings facilitate visual communication with the different publics (Hazleton & Long, 1998; Hazleton, 1993). In our case study, it has been proven that the PR strategies carried out by the Republican candidate matched three of the previous types: persuasive, promise and reward, and bargaining and cooperative problem solving. First, it appealed to emotion and implied a language with a very particular point of view. The messages included a call to action. The promise and reward was “Make America Great Again”.The last strategy, which had the greatest impact on society, is bargaining and cooperative problem solving, which implies that we are all united against an adversary. This approach was designed to unite people in their own interest. However, for Russell and Lamme (2016), the PR strategy applied by press offices do not define by themselves the lines of action, as there are other forms of persuasion, as it is the case of propaganda, which may also have a remarkable strategic value. The media are responsible for the generation of the images acquired by their audiences. Thus, the image that most Spaniards have of the presidential candidates is the one they perceived from the media, especially television, social networks and the press in general. In the case of the U.S. elections, for obvious reasons of distance and language, local media acquired greater importance as they enjoy more credibility than other forms of communication (Losada, 2002; Farias and Paniagua, 2007). The choice of adjectives used to caption images is not a random process. No type of communication can have an impact in the mind of a receiver if they are not loaded with meaning. The image will depend to a large extent on the meaning that the individual is able to perceive from what they receive. There is evidence that the media have a real influence on the perceptions formed by their audiences, regardless of whether the contents are information, fiction or entertainment (Berrocal, Campos and Redondo, 2012). The idea that media are the main mediators of reality to citizens is extended and much of this idea is based on the information published by the media, which turns them into potential image generators. In general, the U.S. presidential elections are of global interest. This time, the election campaign between Hillary Clinton and Donald Trump initially involved the possibility of having a woman in the Presidency for the first time ever. Clinton knows perfectly the establishment and therefore the continuity of the policies initiated by Obama, with the positive consequences of employment growth and the “Obamacare” healthcare reform. She faced a successful businessman who knows perfectly how the media works. However, in the electoral process other factors contributed to the media relevance they acquired in the United States and the rest of the world, including the emails, the leaks about Clinton by WikiLeaks and the Russian hackers as well as the daily rants of the Republican candidate and his authoritarian and populist messages (Koch, 2017). El País newspaper, in its issue of 12 June 2016, rightly stated: “Hilary Clinton and Donald Trump, the most polarised election”. The election campaign stood out for the messages released by the Republican candidate with a distinctly populist character, which gave him greater presence than his opponent in the media. Toth (2009), in its study on rhetoric points out how individuals, groups and organisations through argument and counter-argument create issues and resolve uncertainties, by looking for the attention and support of their publics. Symbolic aspects play a very important role in the construction of the political objectives (Taylor, 2011; Ihlen, 2011). The game of dramatisation, with carefully design scenography, scripts and perfect characterisations, paid off. According to Naegele and Goffman (1956), individuals act in the same way as they would in a drama and act as others want to see them. Burke’s model (1989) classified the ritual of political campaigns. His theory sees drama as a method because it encourages us to consider motivations from the perspective of drama, where symbols and language are part of the movement. As in a theatre play, he defines actors and their scripts, roles, movements and gestures. Marshall (2010) emphasised the importance for public figures to carry out many activities of this type to obtain greater visibility in the media. All in all, a perfectly defined scenographic representation. These theories are very similar to the current concepts of populism. In this case, the Republican actor and candidate polarised citizens by identifying the opposite candidate with the common enemy, positioning himself as the solver of all problems with the motto “Make America Great Again”. To this end, he used patriotic symbols in his public meetings and presentations and was always accompanied by the USA flag and colours, kissing and hugging it on numerous occasions. Instead of kissing a child, which is very common in Europe among politicians, he chose to kiss the flag, awakening the American patriotic sense. Another widely used resource is the strategy of bargaining and cooperative problem solving. As noted above, it is the definition of the candidate as a spokesperson for the people, achieving a rhetorical advantage when the voice and spokesperson of all the evils are his opponents (Dodd & Collins, 2017). Burke (1989) also points out that these actions must be motivated and that is why Donald Trump talks about, for example, the construction of the “wall to prevent drug traffickers and migrants”. It can be said that Trump’s communication style was able to exceed all expectations. Since the beginning of the campaign experienced politicians with different tendencies seemed to have underestimated Trump’s chances of succeeding in politics (Lee and Lim, 2016; Ross and Rivers, 2017; Choma & Hanoch, 2017). Trump’s authoritarian style, his ability to make strong and unconventional statements about race, gender, sexuality and foreign policy, gained supporters among the delegates of the Republican party. However, at the same time, he encouraged a strong opposition among other conservatives. The threats, such as that of the wall, the prevention of Muslim immigration and the non-compliance with trade agreements were part of a populist, grandeur, dynamic and informal communication style that could break all the predictions (Ahmadian, Azarshahi and Paulhus, 2017). His particular self-promotion style was based on the show, which motivated the media around the world, including Spain, to dedicate plenty of informative space to him (Gökariksel and Smith, 2016). Based on these considerations, the study of the selected news media examines the messages conveyed by the candidates in their campaigns but also all the symbolism that each of them used and reflected in the images used by the newspapers, as essential part of the communication (Grünig, 1993). The presence of family members, party colleagues, as well as the support of celebrities from the showbiz, and the flag of the United States have played an important role in this election campaign. The selection of two news media in their digital formats El País and ABC, whose editorial lines reflect in principle the interests of Democrats and Republicans, will give us a perspective of Spanish people’s perception of the election campaign for the Presidency of the United States. “The moderation of the columnist’s contrasts with the firm commitment of the newspapers to direct the vote of their respective readers, which is not necessarily surprising in a media system of historically polarised pluralism, accustomed to assume a function of political leadership” (Campos, Valera and López, 2015, 1629). However, Donald Trump’s extremely populist and radical posture made both newspapers share common interests in the last months of the campaign. This study has two main objectives. First, it reviews theoretical approaches and previous studies to establish the basis to analyse the news content of the most-read Spanish newspapers. The first research objective is to delve into the presentation of information and to identify the treatment given by the press to the phenomenon under analysis. The second research objective is to examine the value of the symbols used in the 2016 presidential election campaign. H1. The editorial line of Abc, a newspaper with a conservative tendency, coincides with the line of the Republican party and its elected candidate Donald Trump, while the editorial line of El País, with a progressive tendency, coincides with the line of the Democratic Party and its candidate Hillary Clinton. H2. Both newspapers used multimedia resources to strengthen the information pieces published during the elections. H3. The symbolism and staging used by the candidates in the elections campaign for the Presidency of the United States is reflected in the images of the newspapers. Donald Trump and Hillary Clinton were officially nominated by their parties on 19 and 28 July, respectively. However, just after months of primaries in late May and early June, they both became unofficial candidates. The period of study starts on 1 June, the end of the primaries in both parties, as it was relevant to research the news treatment since the beginning of the campaign to be able to analyse the editorial lines of each newspaper with respect to the candidates and identify possible editorial changes depending on the actions of the campaign strategies of Clinton and Trump. Although they were not the official candidates of their parties at that time, they were already identified as such. That is why their public interventions were no longer directed towards their party rivals but towards the opposite party. We chose to carry out an analysis of two widely-read newspapers over a long period of time instead of a larger number of newspapers over the last month of the campaign to avoid bias in the evolution of the electoral period. The reasons for selecting these two newspapers are: their national reach, their editorial lines, which represent a view that conforms to the so-called media system of polarised pluralism (Hallin and Mancini, 2004); and as noted, their representative character as the two online newspapers are the most widely read according to the media survey Estudio General de Medios (EGM, 2016). For a greater understanding of the data and, above all, motivated by the different number of articles published in El País and Abc, this research is based on relative values. The statistical program used for data processing and analysis was SPSS 24. 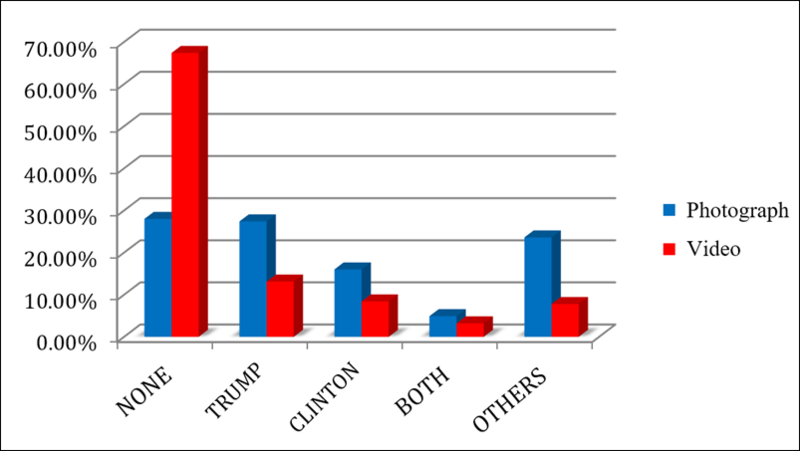 The examination of the image of candidates Donald Trump and Hilary Clinton was based on the analysis of a comprehensive hemerographic study, as shown in the following table. Content analysis was used to make reproducible inferences based on specific characteristics that are identified in the messages (Van der Meer, 2016; Torsvik, 1970; Krippendorf, 1990). This type of analysis will serve to identify trends and reveal differences in the content of the news as well as to compare messages and media, and identify intentions, appeals and symbolic features. To this end, value and frequency analysis were carried out. Its utility to collect, process and evaluate large amounts of information (Sánchez, 2005) and its frequent use in the description of the components of the media messages (Igartua, 2006), makes it the most suitable method of inquiry for this study. Without this tool, it would be almost impossible to carry out a study of this nature (Berganza and Ruíz, 2005). In relation to the purpose of content analysis, it is important to point out that “our purpose is to get closer to the object of study and draw conclusions suited as much as possible to what we have called common sense criteria” (Berganza and Ruiz, 2005 and 213). We created a coding sheet that organised the information in four sections: the first one dedicated to identification variables and the second to information variables. Following Yanes (2004), in this type of studies the treatment given to the candidate in images, both in photography and video, is of vital importance. Therefore, we designed a third section dedicated to visual composition variables. On the one hand, we examined whether the article incorporates a moving or still picture, the protagonist of the picture, and the treatment given to the candidate on the image. Finally, a fundamental aspect in the collection of information from the newspapers are the inclusion of links to other news about the elections. The objective of the fourth section is to examine the viral nature of the news. Results for both newspapers are first analysed in a jointly manner and this is followed by a separate in-depth analysis of the news published by each newspaper. Of the 817 news articles analysed, 52.3% were dedicated to Trump and only 37.8% to Clinton. Therefore, there were more news about the Republican candidate, with 427, in comparison to the Democrat candidate, with 309. El País dedicated more news to Trump, with 29.6%, seven points more than Abc, with 22.6% (Figure 1). The analysis by newspapers and candidates shows that Abc devoted a higher percentage of news to Clinton than to Trump, with 46.3% and 43.3%, respectively. Meanwhile, El País published more news about Trump than about Clinton, with 56.7% and 53.7%, respectively. Following Yanes (2004), we classified the headlines according to the type of information presented, differentiating between informative, appealing and impact types. Informative headlines are the most commonly used, accounting for 55.6% of all the headlines: 28% from El País and 27.5% from Abc. It can be said that both newspapers use this format in a similar way. The second most used headline is the impact type, with 23.3%. It represents 18% in El País and 5.3% in Abc. The other commonly used headline is the appealing type, accounting for 21.2% of the sample. 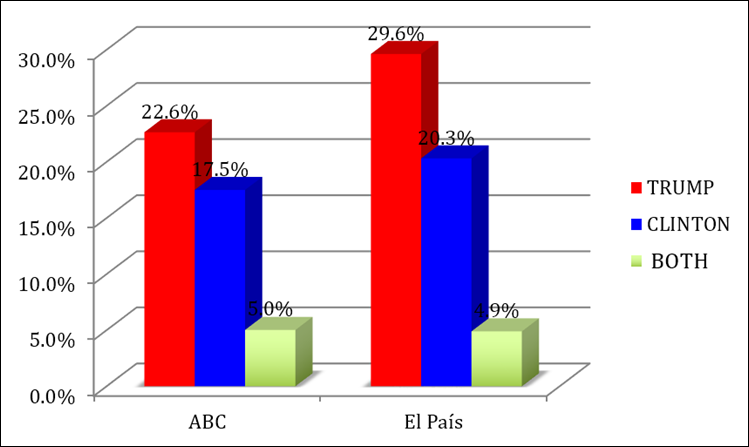 Abc is the newspaper that used this formula the most, with 12.4% against 8.8% in El País (Table 3). Subheads or summary leads have been classified into direct, multiple, interpretive and deferred, according to the definitions offered by Martínez-Vallvey (1995). The presence of multiple and deferred types only represented 1.1% of the total. Direct subheads represent 80.8% of the cases, while the interpretive type only constitute 18.1% of the sample. The analysis of the information by newspapers shows that El País uses the interpretative formula the most, with 17%. Thus, altogether, 93.9% of the subheads are interpretive (Table 4). The treatment of information is another fundamental aspect in the content analysis; its purpose is to determine the critical sense of the news given its direct impact on the image that the media provide about the candidates. Table 5 compares the treatment of information of newspapers without taking into account the candidates. This analysis shows that 34.27% of the news pieces are framed in favour of the candidates, while only 44.92% are framed against. El País published the largest number of critical pieces with negative connotations, reaching 25.09% of the total sample. The analysis by candidate shows that Donald Trump received more negative articles than Hillary Clinton, with 35.25% and 8.94%, respectively. On the other hand, Clinton received more articles in favour than Trump, with 24.36% and 9.67%, respectively (Table 6). So far, we have analysed data globally for the two daily papers. Figure 2 compares all the articles published in both newspapers. Despite being digital newspapers with editorial lines with different ideology, the analysis shows that in the case of the U.S. elections the approach of the newspapers presents similarities. 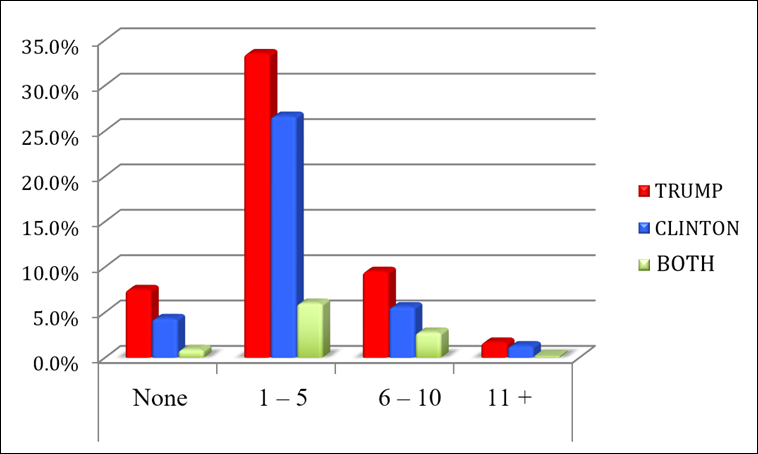 Data were also analysed to determine the newspapers’ treatment of candidates (Figure 3). In this case we can see the trends of each newspaper in relation to the candidate. El País focuses on Donald Trump: 69% of its articles talk about him negatively, while 63.9% of its articles are in favour of Hillary Clinton. However, in the case of Abc, its positive articles are in favour of the female candidate, with 67.9%. Another aspect that draws attention is the radicalisation of the article published by El País. As shown, 69% of articles are against Trump, while 11.6% are in favour and 19.4% are neutral. It should be noted that the sample began to be collected on 1 June and therefore included Trump’s victories over his rivals and the Congress when he was chosen. In these cases, the news articles are neutral. Abc focuses on Clinton, both in its positive and negative articles, with 28.5% for the latter. The case of the emails was treated negative while most headlines for this case in El País were more neutral and put the blame on the FBI or the leaks made by WikiLeaksor the Russian hackers. It is striking that in a couple of articles of Abc, at the beginning of the campaign, the image of Hillary Clinton is associated with the Spanish Podemos party. The first case was in a visit of the still “First Lady of America” to a lunch with the current Mayor of Madrid and the second case was a piece that mentioned that Podemos would support the Democrats on the elections day. Without a doubt, images play a priority role in a digitalised world where information consumption in some cases is fleeting. Quick readings of the articles, link to other news or social networks, as it can be the case of Twitter or Facebook, give images and the headlines of the article extraordinary importance. Hence, this study gives special emphasis to the pictures and videos inserted in the news, and seeks to determine whether there is a direct relationship between headlines and images. Donald Trump was the most photographed candidate, with 27.4%, followed far behind by Hillary Clinton, with a scant 16%. The newspapers used photographic resources in almost all the articles, leaving only 28% of the articles without pictures. Of the 427 pieces about the Republican candidate, 47.8% contained a picture, while in the case of the Democratic candidate 35.5% of the 309 pieces about her included a photograph. The analysis showed that the electoral campaign of the Democratic Party was very supported by the leaders of his party. Thus, a large number of news articles addressed the meetings of President Obama, his wife Michelle and even the actors and singers who supported Clinton throughout his campaign and contain many pictures of them instead of just Clinton. Despite the media under study are considered to be digital, their use of video in news articles is not very common. The analysis of the videos shows that 67.4% of the articles do not include video. It is only in the last days of the campaign, given the interest generated by such election, when videos are inserted more frequently. In total values, Trump is ahead with 13.1% of the videos vs. 8.4% of Clinton. Candidates always try to play with the scenography and try to make the media take the picture that represents and benefits them the most. A clear example is in the strategies of each of the candidates and what they have been reflected in the national media. The following table analyses the importance given to the candidate in the images included in the news articles. Pictures showing the full body of the candidates occupy the first place with 29.9% of the total. The “other” picture category, which often depicts the candidate in public meetings or the street, occupies the second place with 23.3%. Close-ups of the candidate represent 13.7% of the pictures. 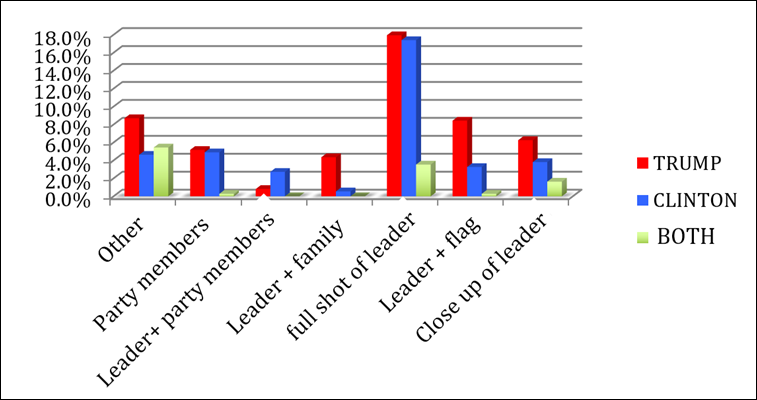 Finally, pictures of the “candidate with flag” are the fourth most common, with 13.1%, and depict almost in exclusive images of the Republican candidate. The analysis of the images according to the variable of relevance of the candidate indicates that Donald Trump occupies the first place with 79.4% in the category “leader with USA flag in the background”. Given the symbolism of this element for Americans, Trump tries to play the role of patriot. His photos or videos are usually about meetings with background with flags or the colours blue, red, and white. Secondly, 75% of the images are photos with the family, his wife, and his wife and children. In the United States the wife of the Presidential candidate, who becomes the first lady of the nation, holds a special place. Despite the scandals of the half-naked photos of Melania Trump, which caused movements among the Republicans, and Melania’s plagiarism of Michelle Obama’s speech, there was no change in the strategy of the candidate. 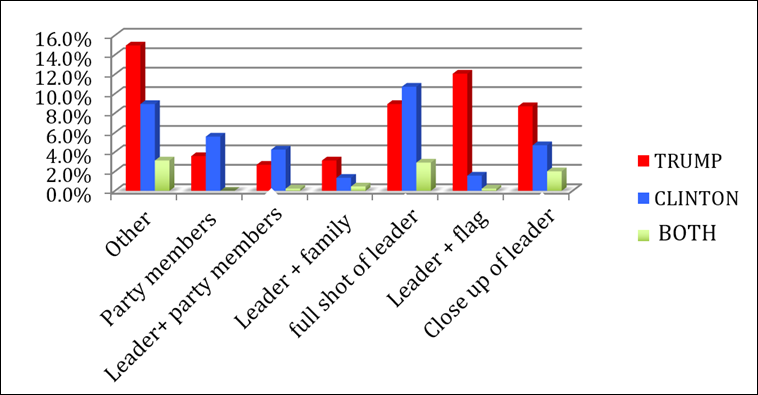 In third place are shots of the candidate’s torso, with 54.5%. This resource is widely used by the media to caricature Trump with his gestures. In the case of Hillary Clinton, her best result, with 64.4%, is the category image of candidate with a member of the party, and secondly, with 50.6%, the image of a member of the party without her. This category is followed with 48.4% by pictures of the full body of the candidate, which are commonly used in meetings and street report, or getting in or out of a plane. Unlike Trump, Clinton uses the symbolism of the flag with only 18.7%. She prefers to relate her images with the slogan of her campaign: “stronger together”. It should be noted in the case of Clinton, the few images that exist of her along with her partner, the former President of the USA (Table 7). At the beginning of the research we believed both newspapers treated graphic information similarly, but the analysis has shown that the disparity in the focus of the images is high. This issue motivated us to examine each journal separately (Figure 5 and Figure 6). The iconography used by Abc focuses on full shots of the body of candidates, while El País shows greater diversity and in the case of Trump, the shot of him with the flag of the United States is the most commonly used, followed by close-ups of the candidate. With respect to the use of links by candidate, the news about Trump generated more links altogether. 33.5% of the news about Trump included 1 to 5 links while only 26.6% of the news about Hilary Clinton included this amount. Moreover, 9.5% of the news about Trump included 6 to 10 links while only 5.6% of the news about Hilary Clinton reached this amount (Figure 8). The growing media approach of election campaigns, the emergence of new technologies and the increase in the use of images offers great communicative advantages and multiplies the opportunities for communication offices. All this has meant an improvement in speed, interaction and actions aimed at their publics. As pointed out by González Molina (2012) and Meyer, Ríos, Sánchez and Bañuelos (2013), the high levels of media exposure, the increased use of technologies and the incorporation of social networks tend to redirect perceptions, attitudes, and behaviours of a significant percentage of citizens. The volume of news generated in digital newspapers, and especially the images in moving and still formats play an important role in the formation of the image of electoral candidates. Communication offices and the American politicians took that into account and knew that they speak for themselves. Thus, Ansolabehere, Iyengar, Simon and Valentino (1994) point out that political campaigns in the mass media stimulate citizens to participate in the election, and trust the candidates and their parties. Goidel and Shields (1994) has also highlighted the importance of great visibility in the media, which can even produce a dragging effect. A clear example of this is found in Trump, who reflects an unrivalled charisma and constant euphoric tone in the news and journalistic images. This is accompanied by a simple language that reaches the entire population regardless of their cultural or educational level. In times of crisis, loss of employment and decreasing purchasing power, citizens want politicians to offer solutions to their problems. It is precisely at this moment when simple and populist messages reach more people. This has been confirmed by several studies carried out by Choma and Hanoch (2017), MacWilliams (2016) and Rahn and Oliver (2016) based on surveys on the Trump phenomenon in the electoral campaign. The message of the Republican candidate woke up the pride of Americans with what has been called Trump nationalism. Thus, Trump manged to convey that a successful business man would know how to solve the country’s problems. Trump aimed to regain traditional values with a simple but dramatic slogan: “Make America Great Again”. What better way to represent its slogan that kissing the American flag at his rallies? All this denotes an electoral communication with important symbolic value but also an emotional perception based on the hope of a better future, with a commitment to solve the problems. The case of Hillary Clinton is completely contrary despite she is a person that knows the establishment to perfection, with an unbeatable political experience, and the support of a party in power and a charismatic President, Barack Obama. Newspapers published photographs that depicted her in meetings surrounded by people and party militants: youngsters, adults, women, men. She preferred to appear beside a party colleague and with people in the background instead of appearing alone or with flags like her rival. The rallies of Michelle Obama, a woman loved by everyone, was a perfect image. The strategies of this candidate were well defined, and the image and dramatisation were well designed. However, it is true that the show increasingly plays a greater role in the election campaigns of the United States. In this regard, Canel (1998) points out that it is the symbolic value that the different dissemination mechanisms grant to candidates give that contributes to the construction of the social representation of political proposals. This is a substantial aspect that allows us to understand the electoral dynamics present in modern democracies, which is strongly influenced by the logic of the spectacle and commercial communication. 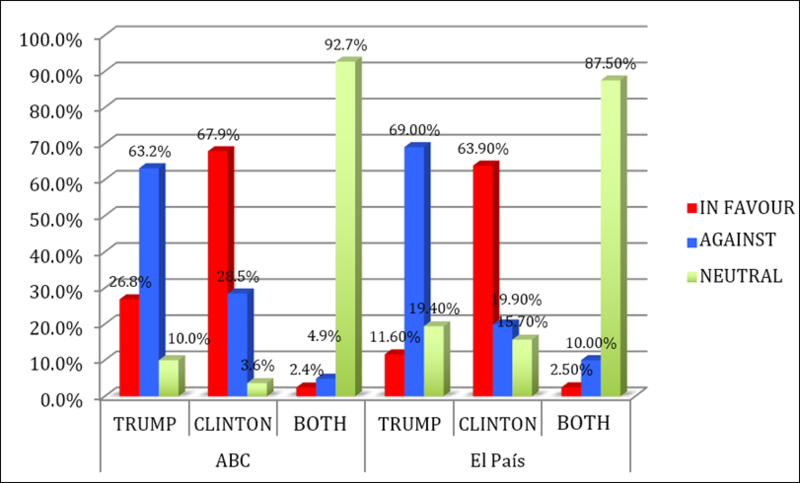 First, the results show that both Abc and El País supported Clinton, which leads us to reject the first hypothesis. Abc has historically been close to the Republican Party and this began to be perceived in the articles analysed in June. It is clear that the figure of Trump did not only manage to divide his party but also that news media with a conservative editorial line, such as Abc, will support the Democratic candidate. They also show that although the newspapers had the same goal they acted differently. The policy of Abc was to promote the candidate while El País was devoted to publishing news articles that were against Trump. The study concludes that there was no constant informational balance between the different candidates. Even if we do not agree with the methods used, it has been confirmed that the Republican candidate had an adequate communication strategy that gained him more space in the media. 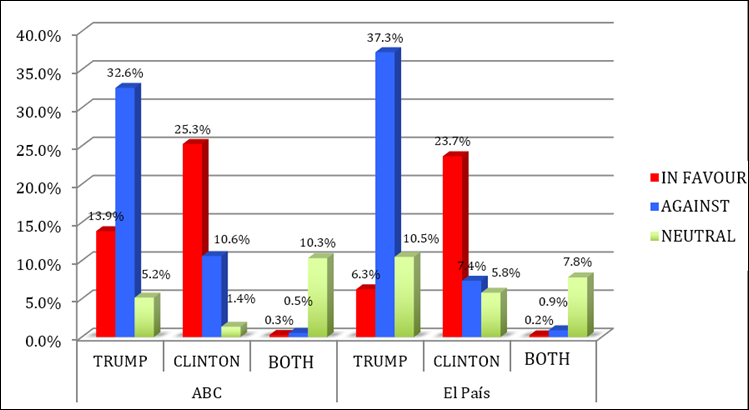 In the analysed sample, Trump defeats Clinton with five points in Abc and nine points in El País. On the other hand, the study confirmed the second hypothesis as the sample of news articles from the selected newspapers are reinforced with multimedia resources and links to other contents as the day of elections approaches. Among others, the articles written by correspondents in the United States include interviews that provide the latest news and opinions. Finally, it has been confirmed that the scenography of the candidates has in fact been perfectly reflected by newspapers. The symbolism and the drama used by candidates in the election campaign for the Presidency of the United States is reflected in the photographs and videos published by the newspapers, which confirms the third hypothesis. The strategies designed by the communication offices and their impact on the images published by the digital newspapers is confirmed especially in relation to Donald Trump. It was confirmed that the images are often contradictory to the headline of the article. An example is Trump, who appears kissing the flag or always with it by his side, which is one of the greatest symbols of patriotism and this image of the candidate is collected to perfection. El País is the newspaper that used this resource the most. Therefore, regardless of whether the headline of the news article is in favour or against, the selected image is the one designed by the candidate. Based on the previous, it can be said that the staging of the candidates has in fact been perfectly reflected by the newspapers. The image of Hillary Clinton is more uniform in the two newspapers and is always reflected in wide shots of the candidate with her supporters on the background. This trend is aligned with techniques widely used in Spain for graphic resources associated with the news. The design chosen by Clinton reflects the closeness that she wants to offer at all times. Of course, it is very important to show the support of her party. In the case of Donald Trump, the three types of image (full shot of his body, candidate with flag and close-up) coincide regardless of the newspaper. However, El País plays more with the images of the candidate and the U.S. flag; which are in accordance with Trump’s slogan. However, we do not know whether the symbolic importance of the use of these resources, mainly photographic, were analysed by the editors or whether editors, due to the large number of published articles about Trump, were forced to select from the photographs provided by news agencies without checking whether the headline matched the sense conveyed by the selected image. As a result of the high symbolic value brought about by the intense media exposure of the candidates and the strengthening of emotional perceptions, it can be said that these had a decisive effect on the perceived image of the candidates. Based on the analysis of the newspapers we have reached two main conclusions. First, the role of the candidates’ communication offices in the design and execution of their PR strategies has been a success; given that the digital newspapers under study have covered them fully. Secondly, El País, classified as progressive newspaper, has failed to interpret the images inserted in the news articles. As a result, these pictures and videos constitute a contradiction with the critical line of the written article. In these cases, the editorial line of the newspaper or the journalists who wrote the news article have not paid sufficient attention to the value of the image. *Funded research: This research article has been funded by the research project Lobbying and communication in Spain. Analysis of communication strategies, of the Spanish Ministry of Science and Innovation. National R&D Programme. Project code: CSO2016-79357-R. National programme for research, development and innovation geared to the challenges of society. 10. Eurostat (2016). Report Eurozone population January 2016. Farias Batlle, P. & Paniagua Rojano, F.J. (2007). “La credibilidad de la comunicación política”. Informe Anual de la Profesión Periodística 2007, Asociación de la Prensa de Madrid. Gausby, A. (2015). Attention Spans. Consumer Insights. Microsoft Canada. González Molina, G. (2012) Switchers: Electores que definen el triunfo. Guadalajara (Méjico): Editorial Universitaria. Hallin, D. & Mancini, P.: Comparing Media Systems. Three Models of Media and Politics. Cambridge, 2004, Cambridge University Press, 2004. JJ Igartua (2006): Métodos cuantitativos de investigación en comunicación. Barcelona: Bosch. Losada Díaz, J. C. (2002). Los medios de comunicación como generadores de imagen corporativa: los públicos internos. Comunicación y Sociedad, 15(2), 95-113. Toth, E. (2009). The case for pluralistic studies of public relations: rhetorical, critical and excellence perspectives in Heath, R.L. ; Toth, E.L.; Waymer, D. (Eds.) (2009). Rhetorical and critical approaches to public relations II 48-60. New York: Routledge. C de las Heras Pedrosa, F J Paniagua Rojano, C Jambrino Maldonado, P Iglesias Sánchez (2017): “Image of U.S. presidential candidates in Spanish digital ‘press’ ”. Revista Latina de Comunicación Social, 72, pp. 975 to 997. Article received on 26 June 2017. Accepted on 7 September. Published on 15 September 2017.